DEBORAH EVANS PRICE (Billboard Magazine): Toby blows away everybody’s perception of what Christian or gospel music is, because Toby makes Jesus look cool. TOBYMAC: I definitely have my ear to the ground as far as sonically what is happening. I’ve always been a pop artist, you know. I rap, I sing, I scream, whatever gets the point across. LAWTON: Experts say thanks to artists like TobyMac, the contemporary Christian music industry is experiencing a revival, with strong sales, record-breaking tours, and new success in the mainstream charts. For three consecutive weeks last fall, the Billboard 200 chart included Christian albums that debuted in the Top Ten. One of them was TobyMac’s “Eye on It,” which was the first Christian album since 1997 to debut at number one. And it was only the third Christian album ever to debut on at the top of Billboard’s all-genre chart. That success is continuing in 2013. In mid-January, Christian artist Chris Tomlin’s new album “Burning Lights” opened at number one. PRICE: It shows the power of the Christian music consumer. For people who tend to want to relegate Christian gospel music to the basement, you know, when an act like Chris, or TobyMac comes in at number one, you have to give that music its due. 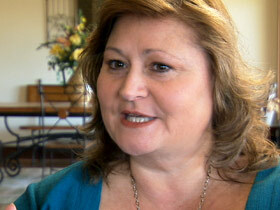 LAWTON: Deborah Evans Price has covered Christian music for Billboard magazine for almost 20 years. PRICE: They sold nearly 23 million albums last year in the Christian gospel market, and that niche market is bigger than other smaller genres like jazz, classical, Latin. What’s wonderful about this genre of music is that the musicians are just interpreting a timeless message in the music that’s relevant today and that keeps younger listeners coming and and keeps widening the demographic. LAWTON: Take, for example, Christian rapper Lecrae, whose newest album “Gravity” debuted last September at number three on the Billboard charts. 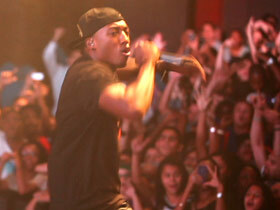 In his music and his publicity, Lecrae is outspoken about his Christian faith. LECRAE: I’d be, you know, crazy to not talk about the thing that’s most passionate to me, and that is my faith. You know, how can I leave that out? It’s all that I am. It defines me. LAWTON: That wasn’t always the case. 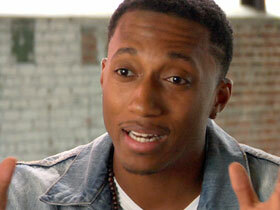 Lecrae says he grew up with few positive male influences and looked to hip-hop for guidance. He wanted nothing to do with his grandmother’s Christian faith. LECRAE: I really mocked it. I thought it was silly. It was for old people. I remember one time ripping out Bible papers and using them to roll drugs up with. So it was…it really didn’t matter to me. LAWTON: His life became a downward spiral of drugs and partying, but he says before he reached 20, he realized the emptiness of it all. 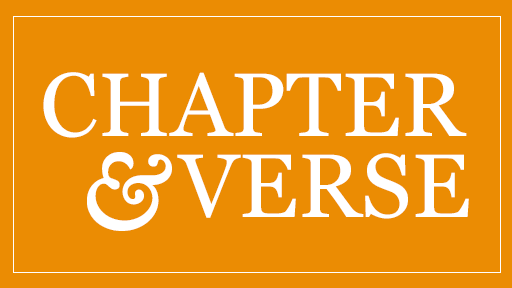 Someone invited him to attend a Christian meeting and study the Bible, and he says, to his shock, the classic Christian teaching about salvation really struck a chord. LECRAE: The simple truth that if there was a God he did love me enough to sacrifice himself for me, like no human being would ever come up with the story that says God reached down to bring me up. And that really, it rocked me in a way I’d never been rocked. LAWTON: Now he raps not only about his religious beliefs, but about being a faithful husband and a responsible father, not typical themes in hip-hop. LECRAE: When you turn on the radio and you hear all these perspectives and philosophies, misogyny and you know, hedonism, most Christians say, ‘I got to find the Christian station to get away from this.’ How beautiful would it be if Christians were to invade the airwaves of mainstream culture and give an alternate view to some of those things. LAWTON: Lecrae has found an audience in both the Christian and secular markets, something that appears to be happening more and more. PRICE: The walls have come down considerably over the past few years when it comes to the divide between the Christian audience, the Christian market and mainstream consumers. But when you have artists like Toby and Lacrae, and all these phenomenally relevant, musically edgy acts, that draws a wide audience, not just from the people in the church pews, but from the people hanging out at the mall. LAWTON: It used to be that when Christian artists “crossed-over” into the mainstream, they watered down the religious content of their music. But the rock band Skillet has achieved huge mainstream success despite its explicitly Christian identity. The group was one of only three rock bands overall to go platinum in 2012. PRICE: There’s been no muddling their identity; they’ve always been, you know, very outspoken about being a Christian band that makes great rock music. LAWTON: TobyMac says he’s pleased to see some of the barriers coming down. TOBYMAC: Jesus didn’t hang out in the church. He hung out with the people where they were, and that’s, to me, where Christian music should be. LAWTON: He first entered the music scene in the late 1980s as part of the ground-breaking Christian hip-hop group DC Talk. More than 20 years later, he says he’s moved away from direct preaching in his music and now tries to write more from his own life experiences. TOBYMAC: I do think that I have something really good. So when you have something really good you can’t help but want to share it with people. I’m not trying to cram it down their throat, I’m not trying to proselytize. I’m just a guy that loves God with all my heart…when I’m at my best. LAWTON: And he says he’s become more open about his weaknesses. One of his most popular songs, “Get Back Up,” is about how he responded to a friend getting a divorce. TOBYMAC: I wrote that song because I probably wasn’t there for him the way I should have been. LAWTON: He says for him, it’s not about cranking out hits and making money, but rather watching how God uses the music to touch people’s lives. For example, he’s heard from several people who say his recent song “Forgiveness” prompted them to reconcile with an estranged loved one. 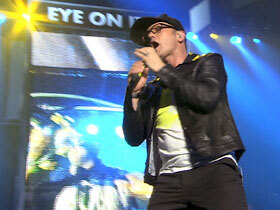 TOBYMAC: When things like that are happening, I mean, you know, I think that’s way beyond me. I mean, that’s why I have faith in God, because I know I can’t conjure up a lyric that would do that. But if God breathes something through me when I ask Him to, maybe something good could happen. LAWTON: Both TobyMac and Lecrae have been criticized by some in the Christian world for pushing the envelope too far. Lecrae in particular came under fire for collaborating with secular rappers who often use offensive lyrics in other venues. LECRAE: Sometimes I’m too churchy for the world, I’m too worldly for the church, and so I exist in this weird, you know, dichotomy, this weird place, but there’s a lot of people like me, and there’s a lot of people who resonate with that. LAWTON: He too sees a deeper purpose in what he does. LECRAE: My hope is that it will be more than music, that it will be a soundtrack of a movement that mobilizes people to see themselves for who they are, for what God created them to be, and to change the world. LAWTON: And that’s not something you hear every day in the music business.